My buddy Doug Lawrence has been a professional singer, music director, and speech coach. He is a highly respected concert artist having sung for almost forty years in venues such as Carnegie Hall, Hollywood Bowl, and throughout Europe with conductors like Leonard Bernstein and Michael Tilson-Thomas. Command attention. The breastbone (sternum) has to be high if you want to project authority. You might want to pretend you’re a rooster showing off. Relaxed sternum = loser, high sternum = winner! Bite your tongue. If your mouth gets dry in the middle of your presentation, try gently biting your tongue. Opera singers use this all the time to release saliva which moistens your mouth. Always perform a sound check before you speak. A good sound person will adjust the EQ to your voice and its idiosyncrasies. If you’re comfortable using a hand mike, do so—work close to the mike and you’ll have a better chance of being heard. If you turn your head, make sure you turn the mike with your head. Lapel mikes usually work fine, but for softer speakers they’re very frustrating. Wrap-around mikes (such as the AKG C520L—$159) that fit over your ear are the best for intelligibility. If you speak often and you know your venues will support this technology, buy a really good one and take it with you. Use your eyes all the time. Hand gestures, pacing around the platform can all be useful tools in presentation, but the eyes…ah, the eyes have it! If you can’t engage people with your eyes you will eventually lose your audience’s attention. Your eyes always tell people whether or not you believe in what you’re saying! Scan the room, select a person to make a point to, and look right at them. It’s a little intimidating for them, but it keeps you focused on the individuals who make up your audience. Keep moving to new people—right, left, middle—it works! If all else fails, look at each person as though you’ve loved him or her all your life—like mom, or your child. Move away from center to make your point. When you come to a place in your presentation where you really want people’s attention, move to the left or right of your primary speaking position. This will always make people look up at you. If you are a constant mover or shaker, stand still for a few moments—it will have the same effect. Get quiet. If you really want to get people’s attention, get quiet suddenly. It will scare the sound guy to death, but I guarantee the audience will pay attention. Singers use this trick all the time. That’s the “you could hear a pin drop” effect. Believe me, that’s what sells your talk! “Underline” certain words with a pause or repetition. If you really want to make a point, slow down, pause, and say the word or phrase that you most want people to hear with a calculated emphasis on each word. The sudden switch in style gets attention. Also try repeating a word or phrase before you make your big point. For example: “You know (pause) you know (pause) you know, the thing I want you to remember is…” Songs are full of repeated text, a device that locks down meaning! Take a risk and be vulnerable. Say or do something that’s totally out of character for you. Use a “pretend” voice like Mickey Mouse or Barry White for effect while you’re telling a joke or saying something shocking or humorous. Whether your persona is reserved or funny, it’s endearing to have a little fun. This trick humanizes the most serious topics. Tee it higher. Raising the overall pitch of your voice for a few seconds will create urgency. It shows your passion for the subject matter and also relaxes your exhausted larynx. Low pitched voices relax the room—high pitched voices increase the adrenaline flow of the audience. Know when it’s time to go. You don’t have to be a genius to know you’ve overstayed your welcome. Check your “presentation barometer” often to see if everyone is still with you. Change something—anything—if you’re starting to lose the crowd. If all else fails, stop talking, start thanking, and get off the platform. People will love you more for knowing when to stop than for all the wonderful content you brought to your topic! Use Q and A as an “encore.” Singers usually prepare an encore because this practice makes the audience feel special and makes them think you like them more than other audiences you’ve encountered. Q and A functions something like an encore. You may think you told them stuff they needed to know, but questions often reveal the important things you left out of your content. Where this opportunity exists, use it as a tool for picking up the pieces you left dangling in your talk and warm the crowd to your candor and self-effacing graciousness. Rehearse, rehearse, rehearse. That’s how I got to Carnegie Hall! Where possible, memorize your material like singers memorize their songs. Remember, the more you rehearse, the freer you will be to make your talk fresh and engaging. Perform for a hero. Several years ago I was asked to sing a command performance for the Queen of Spain. I worked harder on that concert than any I have ever sung. It was very successful and I was proud of my preparation. From that time on I imagined I was about to sing for the queen, it made me twice the performer I had been previously. Pick a hero, and give them your best shot! Doug is a presentation coach; you can reach him via email. – Poll your audience. Asking questions (for example, “by a show of hands, how many people are Mac users?” — this not only engages your audience, but also allows you to specifically tailor your content to your audience. – Avoid inappropriate comments or imagery. I know it may sound like generic advice, but I cringe each time I hear people who make crude jokes or who seem to say the wrong things. You might think a particular joke is terribly funny, but depending on your audience, it may be the worst thing you can say. I particularly remember someone who was doing a photoretouching demo with Photoshop using a racy image of a scantily-clad woman. The group was a predominantly religious and Bible-reading one, and the comments the presenter kept making as they were making adjustments near certain parts of the anatomy weren’t helping any. I’m sure the presenter thought he was being incredibly funny, but the crowd didn’t think so. – Tell stories. Where appropriate, use personal stories to make a point. The audience loves stories and if they are personal in nature, it establishes an emotional connection and you become more believable. Of course, remember to make a point after you tell the story. – Reveal your passion. People always tell me that it’s obvious I care about what I’m saying because of the passion that’s evident to people who watch me. I actually saw this most clearly with Al Gore, as I had the pleasure of recently seeing him personally give his slide show on the environment. If you really care about something, people will pick up on that passion. Whether it’s a moment of anger, an expression of pure joy, or just a pause and a sigh, reflecting on a statement you just made, those become very believable moments. Even if your audience doesn’t agree with what you are saying, or a point that you are making, a truly passionate statement will still have an impact. As always, keep up the good work Guy! Give a performance. That is great advice. I suppose that being a ham helps in this situation. A presentation is a dry, sometimes lifeless, and almost always boring. A performance is acting, entertaining, and usually lively. Great stuff. One thing I’d add to the list is to remember to take a breath and relax. People can tell when you are uptight and nervous. If you’re relaxed and confident, it makes it that much easier to focus on the message. biting one’s tongue to solve for dry mouth … interesting, I’m gonna try it. In one of my high school math classes I remember my teacher always saying “Pay attention to this point because it is important” and he would then deliver a key message. I found that I always paid more attention when he told me to. I use the same strategy when delivering a speech or seminar. There will be times in any delivery that is over 5 minutes when people will drone off. Maybe they forgot their wife’s birthday and have to buy a present or they are wondering if they will get that promotion or they realize how hungry they are and they should not have skipped breakfast. This is the most important part of my post – By telling people to pay attention to a point they are more likely to do so and you will increase the chances of gaining a new customer / partner / investor / etc. Interesting tip about biting your tongue. I’ll try it. Great advises! Thank you, Guy! And thank you, Mordy! Your comments are also very useful addition to the ones Guy posted and I am going to use all of them in my future career as a public speaker. I am going to deliver my first presentation next week and I am somewhat nervous about that. If I succeed it will give me strength to continue my efforts towards the speaker’s career. If I fail, however, this will probably ruin my self-confidence and my will to become a successful public speaker. Wish me luck. I have a reference manual called “Trainers in Motion” that talks about some of these ideas. I give presentations from a wheelchair, and I sometimes use it as a prop to draw interest. It is a bit challenging giving a presentation from the seated position, so voice inflection comes into play too. This article is compelling. Thanks for sharing it. I’d like to add another point to this great post. As a professional speaker and former professional musician, I’ve always approached speaking, training and even keynotes in much the same way my band approached audiences. Say you have a book of about 500 songs that you can play at any time. The particular song that you choose next depends on the audience, what they’re requesting, what they’re dancing to and what they seem to enjoy most. Speaking and training work the same way. I always have about 500 topics which, depending on the audience, their background, issues and questions, I can draw upon at any moment. The key is to take all of your material and break it down into categories, topics, sub topics, stories, comments and one-liners. With no warning at all, you can go to any “lyric” that’s appropriate! 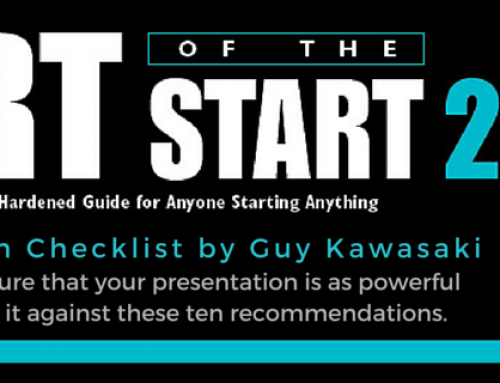 I did stand up a few years back and point #12 is a key point to any kind of presentation. The second you feel you’re losing the audience, call it quits there and then. They’ll either want you to come back for more or be intrigued by what you said and it will add to the performance. Comment #1 is uber important. They say we humans evaluate other humans in the initial 15 seconds of contact. Our innate friend or foe mechanism makes a snap judgement and the rest of the speech may not matter because of a bad first impression. The same is true for job interviews. Professional interviewers say the first sentence usually reveals the interviewee’s true colors and the rest of the interviewee’s answer/comment to the question should be discounted. I try to work the room before giving a talk and to learn background information about individual attendees and their local organization/community in a face-to-face manner. If the information correlates or possibly is tangential to a point in my talk, I make it personal by referencing it to a person in the room and an experience they related to me. Doing this makes the information personal to everyone in the room. Of course, this type of reference is best used for historical accounts or experiences that bring positive credit to the individual. Lastly, as I get older, my inner desire these days is “first, do no harm” in all aspects of daily life. This is especially true when making sales presentations and training talks. I’d rather help them by gently moving them over to a logical/higher value proposition (win – win) than to bludgeon them with high powered intellectual assault involving criticism of competitive/alternative positions or impugning their authority in any manner. Twenty years ago I had to “win”. Today, I’d rather understand my audience and not lead them to any harm. Like Red said to the parole board in Shawshank Redemption, I’d like to be able to talk with that young fellow (myself) twenty years ago and to let him know a Socratic/Hippocratic approach works so much better for everyone involved and especially for folks in sales and leadership positions. Nice photo of you speaking..
Great post Guy! In another life I’m a musician, and for years I’ve seen a vocal coach. If you ever need to pitch or present you should do yourself a favour and go take a half-dozen lessons. I had a teacher in high school who would always say “you missed that, didn’t you?” after every important or key idea. I usually HAD missed it since I was off in my own little world, but hearing him say that would perk my ears up. Of course, I had this teacher for an entire semester, but I believe it to be possible to capture and audience’s attention with a similar phrase even after a few minutes. Good luck to Mike Ramm up there ^^. Find an expression which will capture your audience and let them know you’re about to (or just did!) say something important. Guy, I don’t know how you do it. You post on your blog day in and day out useful information from people who have been there done that. You know it’s good when you see specific examples, and, perhaps most germane, potential pitfalls and mistakes (we all make ’em!) and how they prevented them. As always thank you for spreading the informational wealth — you didn’t have to but you did. By the way, I like your comments made for BusinessWeek on Apple regarding the recent Apple developers conference. I think the most important aspect in public speaking is actually knowing what you are talking about… Being prepared and having a firm understanding of one’s material… To such a degree that one can approach their delivery more like a conversation than a reading. People sense what is real and feel sold to when a speaker reads or dictates their speech. Speech should be seen to signify that one is speaking with, not to someone. Everything is helpful but addressing the memorization, you have to ensure you don’t sound too rehearsed or you’ll inevitably sound mechanical. Also, it’s more advantageous to be flexible to the atmosphere verbally and permit a little spontaneity, customizing it to your specific audience to validate their position as the recipient. Some interesting ideas there; I would have thought that using a nasal voice could be a detriment, but I guess it kinda proves that anything used in moderation works. Before you mingled with us prior to the talk, I thought it was going to be another dry talk on how to make VC’s happy and ourselves rich in the process. (Typical at OSU) However, after meeting with you prior to the talk, you completely changed my perception. 2. Once you get to know a public speaker, you tend to listen a lot closer because you can recognize their personality traits and relate to them. You did well at this talk, I recall a standing ovation. Either way, #1 of that bullet list served you well and made a positive impact on me. Keep up the great speaking! I love the last point. People respond best when they feel respected and served. If you go in overly-confident and arrogant, they won’t have anything to learn from you. I’ve been to a few seminars where it seemed like the “authority” on the subject didn’t even prepare, perhaps because he was speaking for college students. If you prepare as if you’re speaking to royalty, they will feel your respect for their presence and their intelligence. You’ll have more audience participation and they will get a lot more out of what you’re saying. Confidence is important- but don’t think you’re the smartest one in the room. You’re probably not. Don’t take yourself too seriously and amazingly enough, others will take you more seriously. Don’t know why that works…but it does! Thanks for the useful tips. Although if I ever have to use them, you can be sure they’ll slip my mind. I’m so glad I read this before I walked out of the door! I am on my way to present some concepts to a very large client of mine… and this was such a great read! Good stuff! Once I read the part about biting your tongue, I was biting my tongue through the rest of the post…you’re right, it really does work. I just need to stop! These are great tidbits to share with my team – thanks for posting. I often joke that taking Into to Acting (which included improv) while in college was the smartest thing I ever did. Those skills (commanding stage presence, projecting your voice, sucking the audience in and thinking on your feet) and come into play everyday in the working world. Much more so than so many of the classes touted by the business school. I recently closed a fairly big financing deal from a state agency (with a competitive selection process and a bureaucratic selection committe, no less). Was mighty proud that I was able to do it so “easily” and ascribed the selection to my superior content and the obvious clarity of my presentation. This post reminded me of another twist to the story. Turns out I reached my destination about 30 minutes early and entered the room just as the “committee” was taking a break (before my presentation). Recovering quickly, I mingled with the committee members, and even found out some of their soft-spots and pet-peeves. During the presentation, I kept eye contact with some of the friendlier faces. Now I know that the key to all this was my mingling! This is a terrific overview of captivating an audience. Response rates and follow up requests from my presentations doubled after I attended Speaking Circles with Lee Glickstein. He’s in the Bay Area and teaches workshops around the world on connecting with your audience. Check it out: www.speakingcircles.com. I took the day off yesterday from the blog. Its been a crazy couple of days and I just needed a break yesterday. Here are some links Ive accumulated over the last 3 days. And I will probably have more this weekend. The most difficult speaking engagement that I ever experiences was about 10 years ago speaking at the Microsoft TechEd conference. The room started with about 800 people, and by the time I was half way done, there were only about 20 people left. How did this happen? Well, I was working for a company at the time where the marketing people set me up for this conference as a speaker, and they gave me the topic that I was to talk about. The marketing people who lined this up didn’t know the difference between IBM products and Microsoft products. They told me that I was to talk about “Connecting Enterprise Systems to the IBM AS/400 System”. Since the conference was sponsored by Microsoft, they were expecting to hear about Microsoft systems. The morale of the story is that when you have a speaking engagement, be sure to check what the session is being promoted as. This is a great list…printing it right now! #10 is sticking out right now–and the part about humanizing the most serious topics. I think it is so important to connect. You could be the best speaker in the world, but people will remember if you connect. Thanks for putting this together! We’ve been working on a software tool for singing training (“Sing & See”) that gives visual feedback to show singers their exact pitch and also the overtones in their voices – i.e. so that they can see when they are getting those increased higher harmonics you mention in point #3. It strikes me that this could be useful for public speakers also to give some feedback while practising. I don’t know of anyone who is using it for that purpose but would be interested to hear from anyone who is able to try it out. Great advice here! One other recommendation I heard which helped me and can give you a boost of confidence before a presentation: remember that the audience is on your side and they want you to succeed. They want to experience a great presentation! Thinking of an audience that way, instead of thinking of them as a group of critics waiting to pounce on your first mistake, frees you up to embrace some of these tips above. Very interesting and useful, great to have this particular perspective. Mike Ramm — aaaaarrrrrrgh. Please tell me you were joking. Succeed, yes, by all means. And trust that you might well have been much better than you thought (most presenters are their own hardest audience). BUT, never be deterred so easily. Fail early, fail often. Fail with joy whenever you can. Churchill said that success is largely the ability to go from failure to failure with no loss of enthusiasm! Excellent and very practical tips you enlisted for mastering the art of public speaking.Personally speaking, I feel if you are the person who enjoyed most making a speech then chances are you have succeeded in making an impact on your audience too. It turns out I was simply wrong about my prior comment. I thought I recognized a lot of the language in this post. But now that I’ve gone back to the book, I don’t see many more similarities than one could see in any two documents about the same topic, by two different people who are both at the top of the same field. My sincere apologies to Doug, and to Guy. And my gratitude for everyone’s patience. I’ve learned a lesson about spouting off without checking the facts first. Too much rehearsing of a speech makes it more robotic, or like a recital. The speaker should still be excited about the content and mentally engaged with it. If they can reel it off back to front, it won’t feel fresh to them and the audience will msis out on the extra energy. My POV. Interesting. I have to say the only one that sounds off is #2 — it’s harder to breathe and be relaxed if your sternum isn’t. I think that some of the information in this article is helpful, as long as you have it in the right context. It is extraordinarily important to know your audience. Being too animated in some situations can be seen as silly, even childish, whereas, at other times it is perfectly appropriate. The subject matter is helpful, but it is best to get to know some of the key figures you will be dealing with ahead of time. If you can become aware of their likes, dislikes, and preferences, you will be much more likely to discern the best tools for communication.